Designed specifically to clean and maintain the military issue M203 (40mm) grenade launcher and 37mm variants. Two-piece, aluminum, cleaning rod breaks down into 8'''' and 14'''' sections for manageable transport in the field. 5/16''''-27 female threads also allow rod to also be used for short barreled, riot shotguns. Includes heavy-duty, looped and wound, phosphor bronze brush loosenes and remove carbon buildup from the launcher tube. Cotton mop applies solvents and rust preventives. 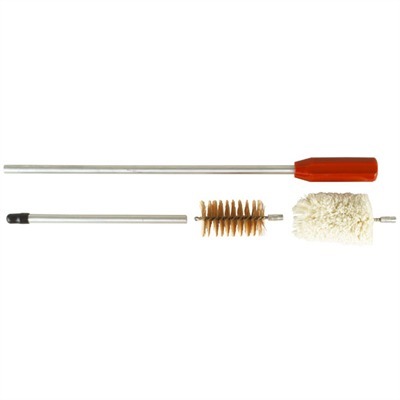 Replacement brushes and mops available separately. Mfg: Dewey SPECS: Kit includes: (1) 14'''' (36cm) aluminum rod w/fixed handle, (1) 8'''' (20cm) aluminum rod extension, (1) 5/16''''-27 phosphor bronze brush, and (1) 5/16''''-27 cotton mop.